The Sennheiser AVX MKE2 Lavalier Pro Wireless Set is designed for use with both pro video and DSLR cameras. It sports a self-configuring digital transmission which eliminates the need for frequency setup. The receiver plugs directly into the XLR audio output of your camera or camera's recording device and features a variety of automatic functions, including auto-dynamic range settings and automatic frequency switching to avoid interference. If your camera does not have XLR out, use the included CI 400 adapter cable with your DSLR's 3.5mm mic port. The included miniature lavalier mic has a high sensitivity response while minimizing handling noises like the rubbing of clothing or body shifting. The transmitter and receiver are powered by high-capacity, rechargeable energy packs. This plug-and-play kit is ideal for seasoned and new videographers alike and is designed specifically for concerts, interviews, and events. 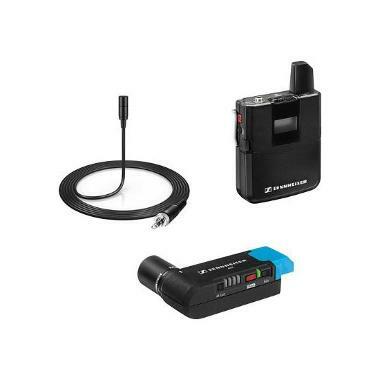 For a version of this wireless system that uses a handheld mic/transmitter combo instead of a bodypack transmitter with lavalier mic, see the Sennheiser AVX Handheld Wireless Microphone Set. • We make every attempt to have a fully charged BA 20 battery and BA 30 battery for you but we can’t guarantee it 100%. If you need fully charged batteries, please request it via the order notes. The BA 20 lasts for approximately 4 hours and the BA 30 lasts for approximately 15 hours. Renting spares may be necessary. Batteries take up to 2 hours to fully charge and can be charged with nearly any USB battery pack or with the included USB Wall Charger with 3' USB to Micro-USB Cable.